Our Children Magazine is the unique voice for parents, published by National PTA, created for the parent who’s always on the go and looking for the best info to help their child excel at school and in life. 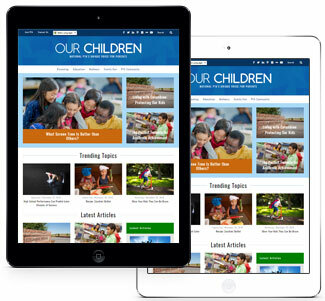 Sign up to receive the Our Children e-newsletter. Get access to ideas and tips that will help your kids—and the whole family—throughout the year! Our Children Magazine is also printed twice a year and distributed to PTA members. Read our digital edition. Stay up-to-date on great teachable moments and ideas to create a community that supports your child’s success from Our Children Magazine. Check out these articles below. Our experts reveal how you can actively help your child manage their anxiety and train their brain to be resilient and ready to take on new challenges. Juggling all of your responsibilities as a parent and PTA leader can take its toll. Use these tips to keep from dropping the ball. Raising a human being is not an easy task, and there's no simple formula. But steer clear of these most common mistakes parents make. As a parent, you may ask, “What is the secret behind getting an A?” Having effective study skills may be the tipping point. Research shows that when families are involved at home and at school, children attend school more regularly, earn better grades, enroll in high-level programs and have higher graduation rates. For the health and well-being of your family, there is perhaps no better habit to adopt (or reignite!) than regularly cooking and eating together. Playtime is serious work. It may not be obvious, but your child is developing serious interpersonal skills while they make-believe.